A few months ago, I received a great note from a relatively new client. It happens quite often, but it’s never surprises, this stuff really works! Just wanted to drop a note to tell you that I just got my first new client using your crazy program! I expect to get many more as the response that I am getting from the follow up phone calls seems to be very positive. The one account that I got should result in at least $40,000 in commissions this year for my recruiting business. Dan has three different businesses. This campaign was for his sales staffing company, in Atlanta, GA (he also has a speaker training business and a cold calling training program). Get 20% off your bank bag with coupon code bankbag20. I highly suggest you open and read his letter right here before you read any further. Dan is using the “Dream 100” campaign strategy that I’ve spoken about at length before. He’s mailing monthly to a high-value list of just 35 businesses, calling the following week, and sending emails and LinkedIn messages the next. In all, in touches his idea prospects 3 weeks in a row during the month, gives them a week off, the starts all over again. I’m guessing once the campaign “proves itself” further, Dan will ramp up to 75-100 per month. I ALWAYS recommend that you either start out with a phone call or follow up with a phone call to be sure they received your letter. In the B2B world this isn’t a problem. If you’re B2C, you have a little more to consider with the “do-not-call” lists and other ‘consumer protection’ initiatives our government has used to cripple many businesses. Keep the number small enough for you to manage. Choose a highly targeted segment of your current prospect list you believe you can have success with OR pick a list of your ideal clients. For solo-entrepreneurs that may only be 25-50, for larger companies with a sales force, it could be hundreds. Dan, to start his test, sent only 35, Whatever you do, keep it small enough that you can micro-manage it from the beginning. Remember, these are your DREAM clients, so micro-managing it is a GOOD thing. Send out your attention-getting, clutter busting 3D Mail, and follow it up with a phone call. Try to get to the decision maker on your phone call, but even if you get the gatekeeper, ask if they received the piece you sent. If it’s 3D Mail, they are almost guaranteed to remember it. They’ll likely even get a chuckle out of it. Repeat the above sequence every 30 days until all your “Dream List” become clients. It takes discipline, but it can work wonders for your business. 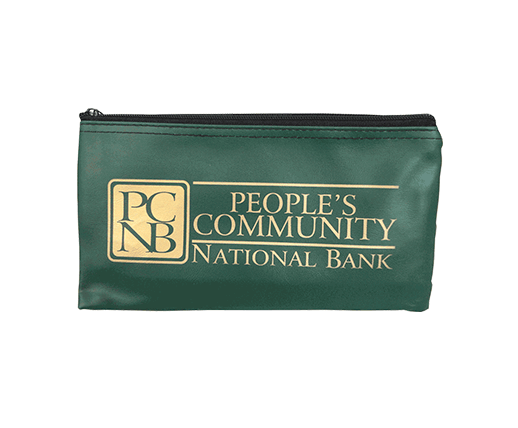 The bank bag is far and away our bestselling 3D Mailer. Marketers all over the country mailed 41,347 of our bank bags in 2018. If you laid them end to end the bags would be over 37,901 feet long, or nearly 7.4 miles! Take 20% off the bank bag. Just call 888-250-1834 or visit us online right here to order. Simply use promo code bankbag20 to get 20% off. The bank bag works as a self-mailer. Simply attach your mailing label to the back, un-printed side of the actual vinyl bank, tape down the zipper and drop it in the mail. Watch a short video here for more. We can fulfill the entire mailing for you, print the letter, insert it, add postage, the whole 9 yards. Just give Tara a call at 888-250-1834. Take 20% off the Call 888-250-1834 or visit us online right here to order. Simply use promo code bankbag20 to get 20% off.